Hersonissos, just outside the party zone. 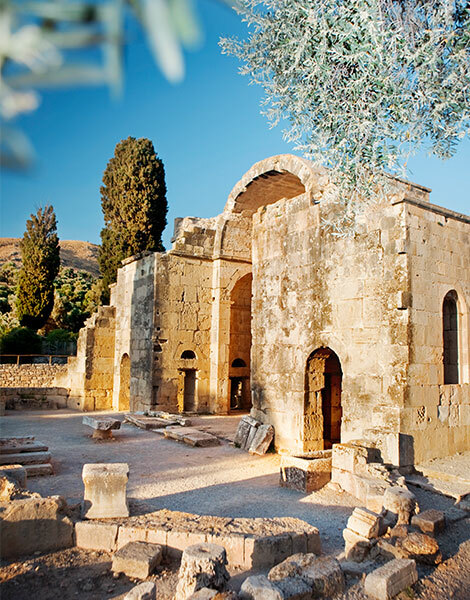 World-renowned Minoan palaces, towering mountains and tourist hotspots make the region around Crete's capital unmissable. Any visit to the Cretan capital of the city of Heraklion should include trips to the surrounding countryside to take in some of the incredible sights this region has to offer. 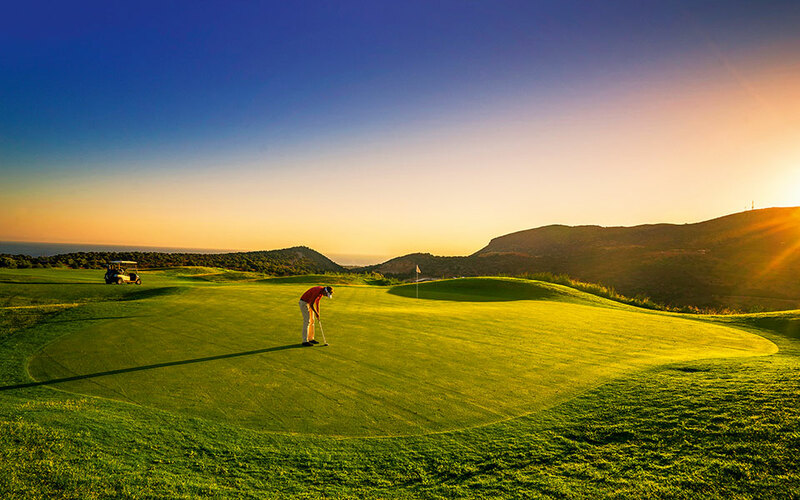 Whether golfing, waterparks and a thumping nightlife are your style, or you prefer secluded beaches and wild mountain trails, Heraklion offers it all. This guide will help you plan the perfect itinerary. CRETAQUARIUM: Roughly 15km east of the city of Heraklion, in the area of Gournes, lies one of the largest aquariums in Europe, covering an area of 5,000 square meters. It’s an underwater world with evocative lighting designed to simulate Crete’s rich marine environment. 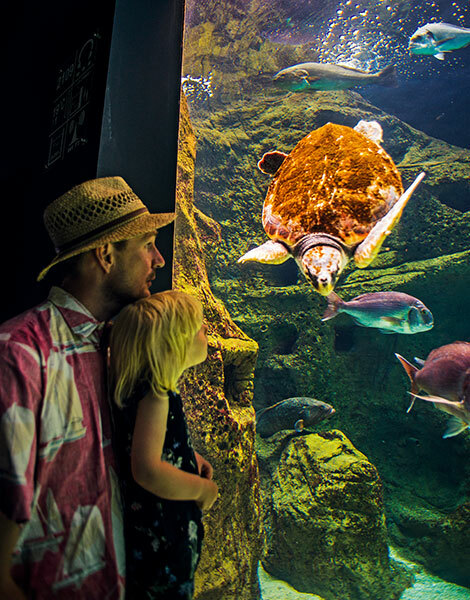 All around you, in massive tanks, live more than 2,000 sea creatures from 200 species, including sharks and sea turtles (www.cretaquarium.gr, Open 09:30-21:00). CAVE SANCTUARY: Road signs outside the village of Skotino will lead you to the cave of Aghia Paraskevi, otherwise known as Skotino Cave. Walk down the short footpath until you reach the imposing entrance. 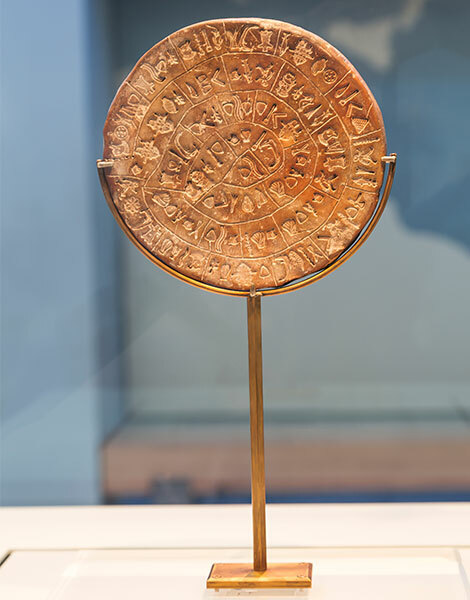 Offerings found in the cave suggest it was a sacred shrine dedicated to Britomartis in Minoan times and to Artemis in the Classical Greek and Roman periods. Although you can’t explore its entire length of 126 meters (the cave hasn’t been fully prepared for visitors), you can descend into the main chamber and see the stunning rock formations. 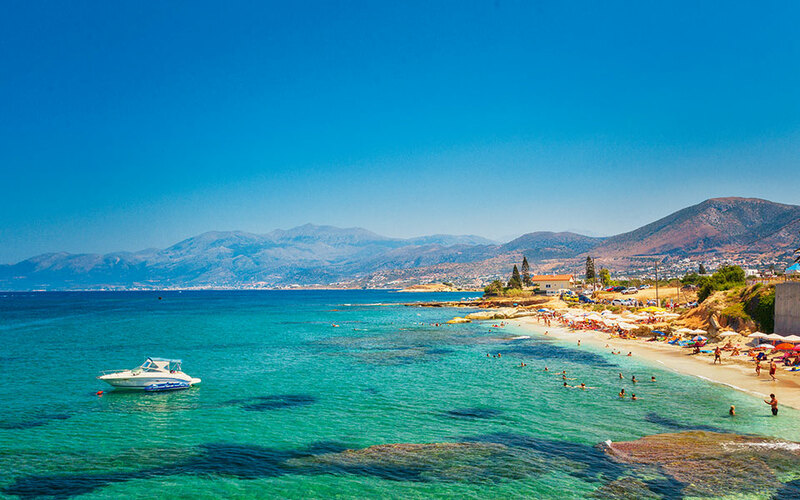 ROUND-THE-CLOCK PARTYING: The most famous resort area of Crete is one of the top Greek destinations for travelers from Scandinavia, Britain, the Netherlands and Russia who arrive by charter flights to party around the clock. At Hersonissos and Malia, you’ll find all-inclusive hotels, restaurants and fast food outlets, along with countless bars where almost anything goes. Although excesses of previous years have been curbed, this part of Crete is still the number one area for hedonistic nightlife. There are large waterparks, too, such as Acqua Plus, which provide hours of fun during the day, and other family attractions including the Labyrinth theme park and the Lychnostatis open-air museum, a recreation of a traditional Cretan village. The 18-hole course of The Crete Golf Club, considered one of the best in Europe, is here as well. 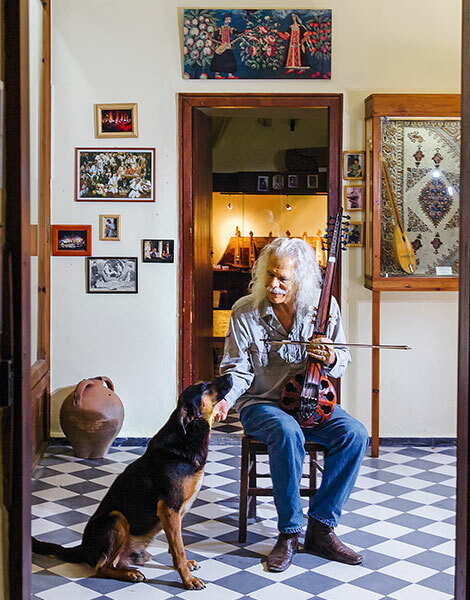 CELEBRATED CERAMICISTS: Head for the village of Thrapsano, famous for its ceramics. While there’s evidence of pottery-making here in Roman and Byzantine times, the art reached its height in the early 20th century, when the potters of Thrapsano would move for months to different parts of Crete, setting up temporary workshops to cover the demand for large clay vessels for storing wine, oil or other products. 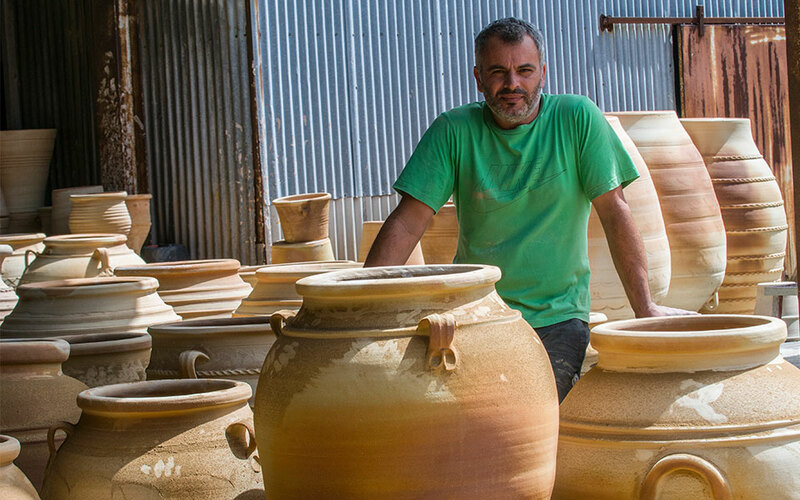 Today, at the MINOS Potters Cooperative in the village, you can watch potters produce exquisite clay vessels, all created by hand and finished in wood-fired kilns (www.minos-ceramics.gr). HISTORY, RELIGION & ART: Located near the village of Potamies, the Church of Panagia Gouverniotissa is an outstanding Byzantine monument and a popular place of pilgrimage for Cretans. Once the main church of a now deserted monastery, it was restored and opened to the public thanks to local efforts. 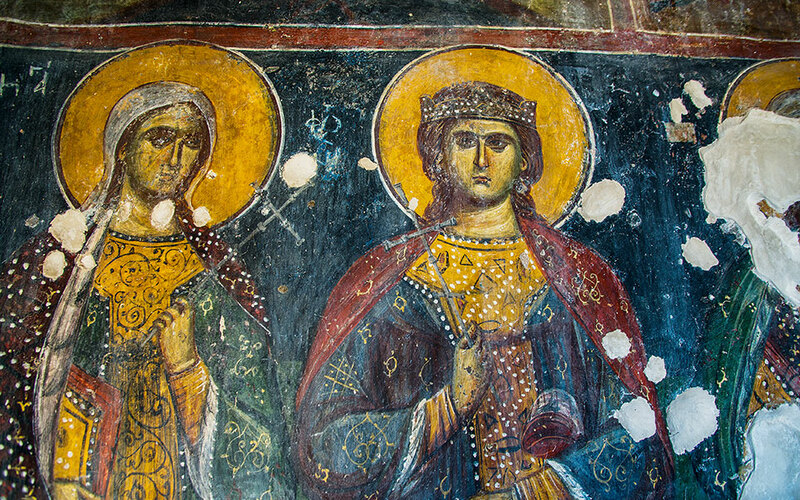 The monastery was built in the 14th century, while the splendid paintings that adorn the interior of the church are among the most important works that date to the final period of Palaiologan Byzantine art (Open Tue-Sun 09:30-17:30). LINK TO THE PAST: As you head from Hersonissos towards the Lasithi Plateau, you’ll spot the Aposelemis Dam, created for irrigation purposes, outside the village of Potamies. When the water level falls, the submerged village of Sfendyli reappears. Nearby is the beautiful village of Avdou, which only comes to life in the summer. The old shops have all closed, but the attractive buildings have been preserved and the local cultural association has put up signs to remind people what was here. Enjoy a snack at one of the coffee shops or discover the nearby caves and Byzantine chapels. The August 15th celebrations here are a must. A PLANE TREE AND A MONASTERY: In the village square at Krasi stands one of the largest and oldest plane trees on Crete, said to be almost 2,000 years old. The trunk is so huge that 14 men can link arms around it. A café-restaurant stands nearby, and opposite it are the water spouts with running water from Mt. Selena and the stone troughs where village women once washed clothes. Close by is the village of Kera and the 9th-c. Kera Kardiotissa Monastery, one of the most important places of pilgrimage in Crete. FLOWER POWER: Matala, the ancient port of Phaistos and later of Gortys, is one of the most famous beaches of Crete, thanks to the hippies who took up residence in its cliffside caves in the late sixties, forever changing the destiny of the locals, who set aside their fishing nets to set up tourism businesses. 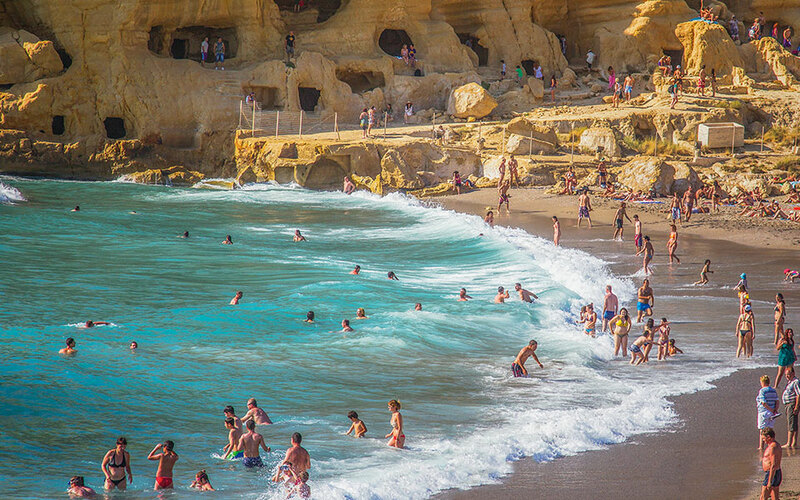 Matala still retains the charm of a traditional fishing village, while the beach itself and the nearby archaeological site are further reasons to visit. At a short distance lies the beach of Kommos, backed by gorgeous sand dunes. GREAT STOP-OFFS: At the village of Siva, stop for a glass of raki and a meze at the traditional kafeneio with the green façade on the main street. In the nearby village of Kouses, you’ll find the delightful shop Botano, which stocks a huge variety of therapeutic herbs and spices, soaps and essential oils. On the store’s small patio, you can sip a refreshing herbal beverage while taking in the amazing view across the Messara Plain. 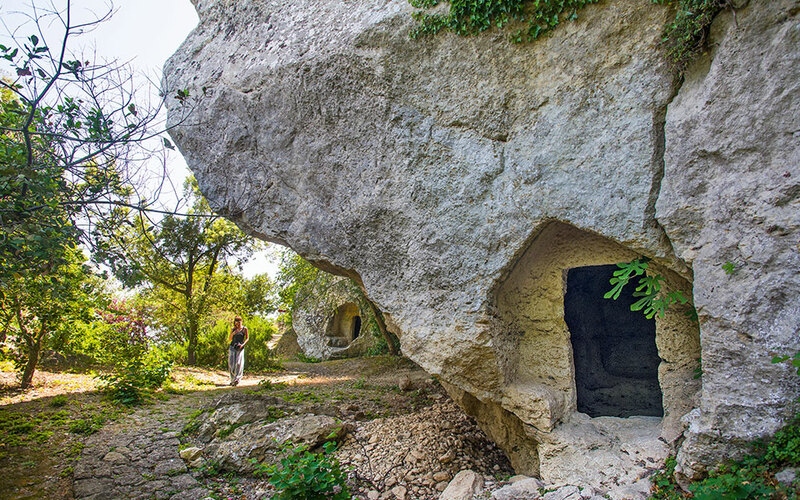 ASTEROUSIA MOUNTAINS: Shrouded in mystery, these mountains had begun attracting ascetics from before the 7th century, individuals who chose to live in mountain caves and on remote slopes. It’s no surprise, then, that the area has a number of historic monasteries, including the 14th-c. Odigitria. The terrain here is bleak and barren. Rough, winding dirt paths lead down to the coast, which is punctuated by small settlements with summer homes and some wonderful beaches. VILLAGE-GUESTHOUSE: The village of Kapetaniana is the most beautiful in the Asterousia Mountains and serves as an ideal base for exploring this part of southern Crete. Most of the houses have been lovingly restored and now, as Thalori Guesthouses, they offer not only accommodation but also an overall travel experience. The view over the Libyan Sea is majestic, and so is the sight of the imposing peak of Mt. Kofinas. The complex has a swimming pool integrated into the natural setting and a restaurant serving Cretan cuisine (www.thalori.com). CONQUER THE SUMMIT: Follow the footpath that begins at the small church of Panagia Kera outside Kapetaniana. A 15-minute walk up staircase-like rocks will bring you to the highest peak of the Asterousia mountains, Kofinas (1,230m). From there you’re looking out over the Libyan Sea on one side, and across the Messara Plain and towards Mt. Psiloritis on the other. The Minoans had built a peak sanctuary here, in the place now occupied by the tiny church of Timios Stavros (the Holy Cross). If you are here on September 13, you’ll witness an ancient rite of tree-worship; from the “Little Apple Trees of Kofinas,” as the three trees on the north side of the summit are called, miniature fruits are gathered, blessed, carried in procession around the summit and then eaten by the faithful. REGENERATION: The village of Ethia, in an amazing location in the Asterousia mountains, was gradually abandoned during the 1960s. However, in the last decade, its former inhabitants have been making efforts to revitalize it. Carrying out most of the work themselves, they have created a water supply system, planted trees, repaired roads and restored the houses. Your visit will give today’s residents great pleasure and afford you the opportunity to enjoy a glass of raki and some tasty snacks in their company. BEACHES BELOW THE ASTEROUSIA: Almost all the beaches here are covered with pebbles, washed by deep blue waters and accessed by dirt roads. If you’re looking for isolation, head for Vathy and Martsalo, which you can reach after a 30-minute walk from the area of the Odigitria Monastery. One of the most beautiful beaches is Aghiofarago, although it does tend to attract a lot of boats in August. You can reach this beach after a 20-minute walk through a gorge. Lendas is easy to reach, on a narrow paved road, and for this reason is more developed. It’s worth taking the dirt road to Aghios Nikitas Beach below the village of Ahendrias; there is a delightful palm grove nearby. On the east side of Asterousia, you’ll find the lovely beach of Listis, reached by descending a short footpath, as well as that of Keratokambos, which offers a number of amenities but also has quieter sections. 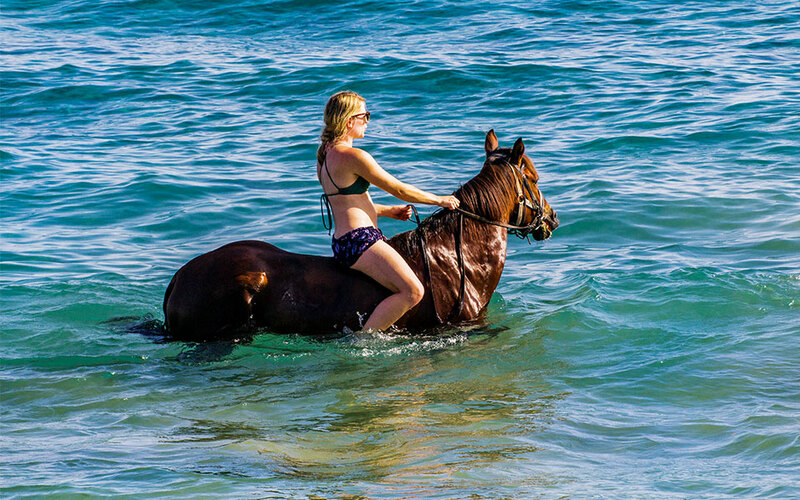 There, you can enjoy horseback-riding on the beach or visit the unexpectedly impressive Gallery “Savvas Petrakis” which houses the works of celebrated Greek artists (Tel. (+30) 28950.514.59). OMALOS PLATEAU: After a stroll through the historic village of Ano Viannos, where German troops carried out mass killings of civilians during World War II, and a coffee break at one of the small cafés in the square in the shade of the large plane tree, head for the village of Kato Symi on the border with the Lasithi region. From there, make your way along the rough 10km dirt road up to the Omalos Plateau to the south of Mt Dikti, at an elevation of 1,300m. One of the least known and most remote areas of Crete, its landscape is bare in summer, snow-clad in winter, and verdant in spring. There is no cell phone signal and the only signs of life are the shepherds with their goats and sheep, who spend their summers up here in stone huts known as mitata. Nikos Stavrakakis and his nephew, Kostis Fragiadoulis, will be happy to show you how they milk the animals and make cheese. MAGICAL ZAROS: It’s worth visiting the village of Zaros, in the foothills of Mt. Psiloritis, for many reasons. 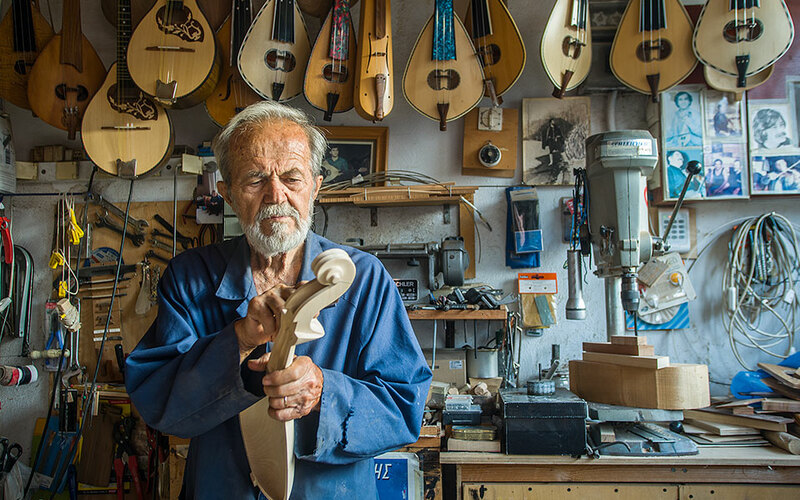 First of all, here you’ll find the workshop of Antonis Stefanakis, where you can learn all about the lyra, the lute and many other traditional Cretan musical instruments (stefanakis-antonis.gr). If you make your way up to the upper neighborhood, you’ll soon reach the small artificial lake of Zaros (or Votomos), a great spot for a walk. This is the source of the Zaros brand of natural mineral water, which in 2017 received an award for the best bottled water in the world. From the lake, continue on the footpath along the Aghios Nikolaos Gorge and after a 5km walk, you’ll come to the forest of Rouvas, the largest holm-oak forest in Europe. The courtyard of the small church of Ai Yianni, is a great spot to rest and even have a picnic; locals even use it for feasts from time to time. TIMELESS VILLAGE: Winner of a European Award for Village Restoration, Epano (or Ano) Archanes is a destination in its own right. In Minoan times, there was a palace here considered equal in splendor to the celebrated one at nearby Knossos, a section of which you can see in the old neighborhood. Walk along the narrow, stone-paved streets between brightly painted houses and colorful displays of blooming flowers; visit the Archaeological Museum (Open daily, except Tuesday, 09:00-15:00); and relax at one of the inviting coffee shops or tavernas. 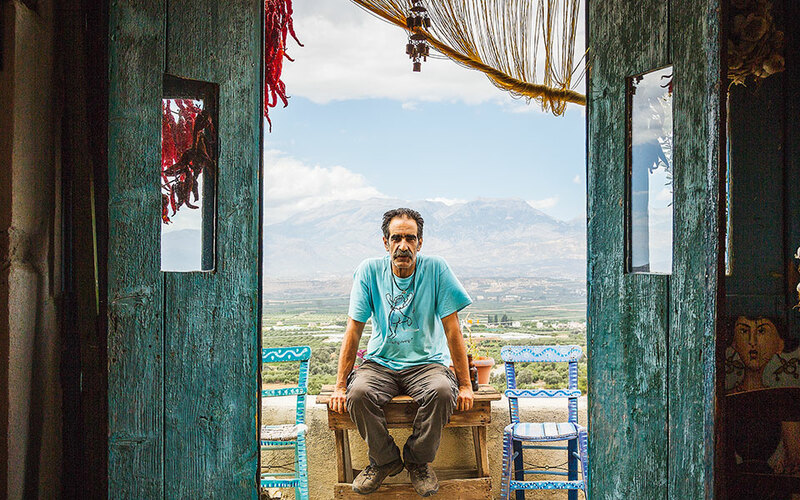 Particularly recommended is the cooperative café Ploumi, which serves small dishes featuring fresh, local products and organizes Cretan music evenings and workshops; you can also buy local products and artworks made by its members. 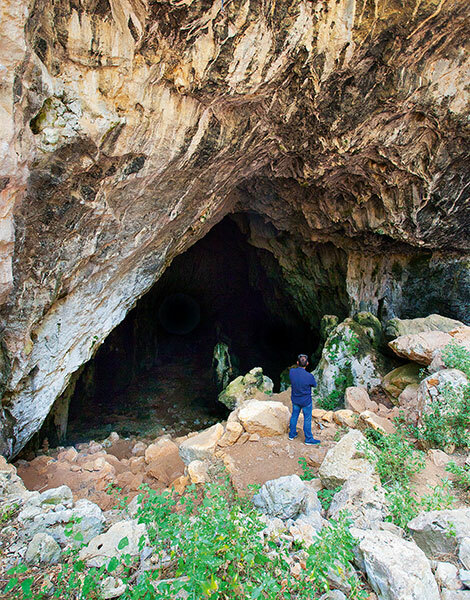 THE UNDERWORLD: The village of Aghios Thomas would appear to have a special relationship with the Underworld; according to legend, this was the site of the “Hole of Hades,” the gateway to the realm of the dead. In Roman times, there was an extensive necropolis dug into the imposing rocks, and much earlier an ancient sanctuary dedicated to chthonic deities (Demeter, Persephone). These were later replaced by the cave chapels you can still see today. Keep an eye out for one very unique chapel, hewn into solid rock and dedicated to a certain Saint Joasaph (from India! ), as well as the Church of Aghios Thomas, built on the site of an ancient temple. The stone pathway above the square will lead you to the most impressive rock tombs. It may all sound a little macabre, but your visit will certainly be a memorable one. DEDICATED TO KAZANTZAKIS: Myrtia is a charming, vibrant village, ancestral home of the Greek literary giant Nikos Kazantzakis. 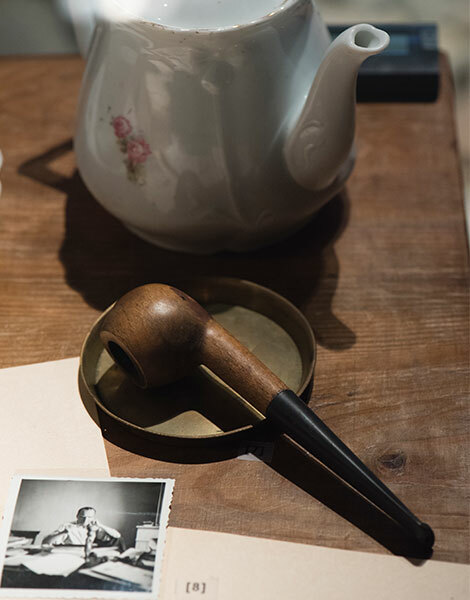 A museum dedicated to the writer stands in the main square (Open daily 09:00-17:00), an amazing place that makes use of digital media to inform visitors about the life and work of the author of Zorba the Greek. Also on display are some of his personal items, along with priceless documents such as the manuscript of Saviors of God, Kazantzakis’ spiritual testament. Take a walk around Myrtia with its flower-bedecked courtyards and chat with the proud, welcoming locals. 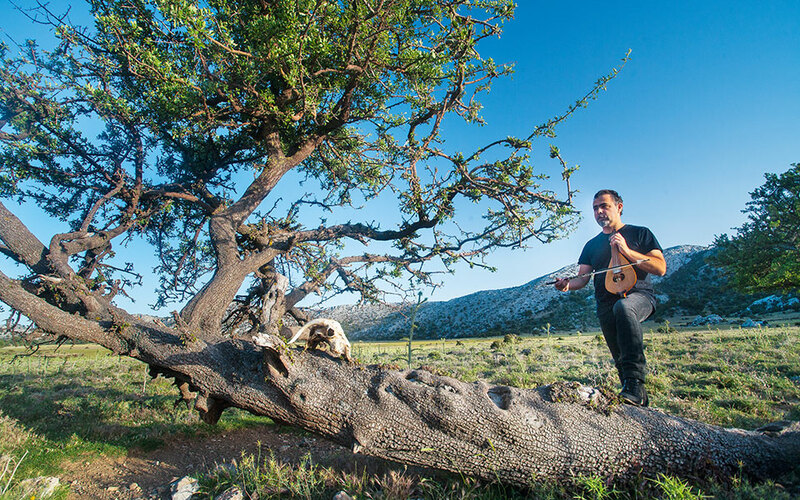 MUSICAL LABYRINTH: In the village of Houdetsi you’ll find Labyrinth, the music workshop founded by Irish musician Ross Daly, who has dedicated much of his life to preserving traditional Cretan and world music in general. In the summer, in the workshop’s enchanting gardens, seminars are held with a focus on modal traditions, playing styles and particular instruments, as well as concerts and other events which are open to the public. (www.labyrinthmusic.gr). What is the Cretan Diet?